The Palestinian Authority Winter has reached Gaza: some 500 protesters called to overthrow their Hamas terror rulers late Tuesday. The demonstration was ignited by the death of a little boy who died in a fire that resulted during a power outage in Bureij. 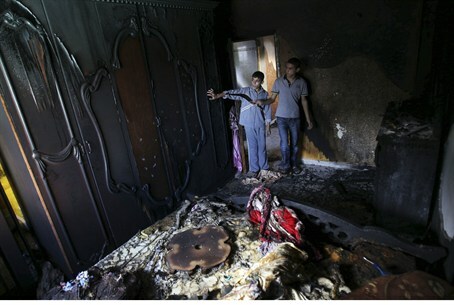 His baby sister was left in critical condition, with burns over a large percentage of her body. The fire started when a candle lit by family members due to the blackout burned their house down. Protesters poured into the streets of Bureij, where the boy's family lives, as 3-year-old Fathi al-Bogdadi's body was being taken to the hospital. "The people want to take down the regime!” chanted the demonstrators in a manner that triggered regime changes in numerous Arab nations throughout the Middle East. The dead boy's father called for more protests, saying he hoped a healing of internal PA political rifts could ease problems in Gaza. “I called on people to take to the streets and not to fear being clubbed by security personnel,” said 23-year-old Abdel-Fattah Baghdadi. A civil guard at Gaza's Religious Affairs Ministry, Baghdadi earns only NIS 1,250 (approx $318) per month. He has been using candles to light his home during the hours there is no power supplied by the Gaza grid, he said, because he cannot afford a generator of his own. The money he makes, he explained, he spends on his large extended family, as well as his wife and two children. "I hold both the governments in Gaza and in [Ramallah] responsible for what happened to us,” he told reporters. Households in Gaza have been allocated just six hours of electricity per day since February due to shortages in the region that Hamas has blamed on Egypt and Israel. Egypt, says Hamas, is restricting the flow of fuel to Gaza. Israel has enforced its border with the region since 2007, when Hamas seized control of the region in a militia civil war. At that time, Hamas ousted the Ramallah-based Fatah faction that leads the PA government and which currently controls the remaining PA-controlled areas of Judea and Samaria. Hamas government spokesman Taher al-Nono responded in statement demanding that Egypt help solve Gaza's power crisis, and the international community force Israel to lift its blockade. Rulers in Tunisia, Egypt, Yemen and Libya were all toppled in 2011 due to what became known as the “Arab Spring” – revolutions that all began with grassroots protests calling to overthrow the government. Meanwhile, in an attempt to quell further unrest, Hamas has banned protests -- as did many Arab governments last year -- including demonstrations calling for unity with Fatah.